Small Holes On Leaves – What Are Flea Beetles? You may have noticed some small holes on the leaves of your plants and you are wondering what kind of pest caused these holes? 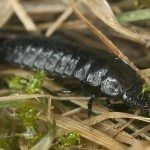 Some pests in the garden are more annoying than harmful and flea beetles are can be classified as that. While in most cases, flea beetles will not kill your plants, they can damage the leaves and be a nuisance with their hopping ways. There is no one scientific name for a flea beetle because flea beetles are actually several beetles in the same general family. Flea beetles are normally characterized by being very small and the fact that they jump from place to place like fleas do. Because flea beetles actually make up a larger family of beetles, they vary in appearance. Some may be black, others brown and still others green. They may also be striped or have colored spots or lines. What are Flea Beetles Doing in Your Garden? Flea beetles end up in your garden for the same reason most pests end up in your garden. They are feeding. Most species of vegetable flea beetles only eat plants from one family. So if you have eggplant flea beetles, then they will only bother your eggplants, tomatoes and peppers, which are all in the nightshade family. If you have corn flea beetles, they will only bother corn plants. The signs of flea beetles are easy to spot. Flea beetles feeding will leave small holes in the leaves of the plant, almost as if the plant was hit by buckshot. Flea beetles larva will also attack the root system of a plant, which may make the plant more susceptible to other pests and diseases that will kill it. While the damage done by flea beetles feeding is unsightly, most plants can survive a flea beetle infestation. The only plants you need to worry about are very immature plants that may not survive either the leaf or root damage caused by different flea beetles. Because this is a pest that does little damage, you are best to use organic control of flea beetles. Once flea beetles have infested a bed, it is rather difficult to get rid of them for the current season (even with chemical controls), but steps can be taken to reduce the infestation and then eliminate it for next year. Add a thick layer of mulch to the bed. This inhibits the ability of the larva to come up from the ground when they become adults. Vacuum up the flea beetles. Literally take your household vacuum out to the garden and vacuum up the pests. This is effective but will need to be repeated as more flea beetles surface. Weed often. This removes additional food sources for the larva who feed on plant roots. Clean your garden thoroughly when the season is over. Removing dead vegetation will remove places for the mature flea beetles to overwinter. Rotate your crops. Remember, adult flea beetles will only eat one kind of plant, so rotating crops will help. If your eggplants were infested this year, make sure not to plant a nightshade family plant there next year. If you follow these steps for organic control of flea beetles, then your flea beetle problem will be gone in a matter of a single season. The small holes on the leaves of the plant will stop happening and your plant will once again be able to grow without damage.